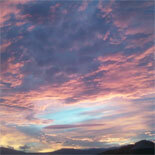 If you're looking for things to do in Palm Springs, CA, you've come to the right place! The adventure, Nightwatch Stargazing Jeep Eco-Tour, begins the moment you board the big red jeep and depart on an exciting tour of the San Andreas Fault! 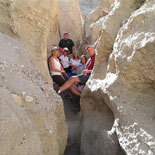 Travel to a private 840 acre preserve on the San Andreas Fault where you will learn about the desert's plants, animals, history, geology, and earthquakes. 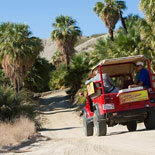 Journey through a natural palm oasis, spectacular box and slot canyons, and an ancient fossil bed as your jeep winds its way through the incredible labyrinth of geological cuts and canyons of the San Andreas Fault Zone. 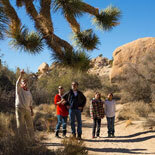 Explore a Cahuilla Indian Village exhibit and Old Mining Camp with Gold Mine Exhibit and Gold Panning. When the sky darkens, you will be treated to a fascinating stargazing journey through the night sky using state-of-the-art "Sky Scouts" and laser light pointers. The beauty of it all is awe inspiring and many times breath-taking. 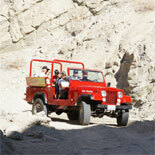 Don't miss this great Palm Springs tour, get your eTickets today for the Nightwatch Stargazing Jeep Eco-Tour! 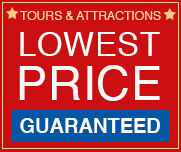 This tour is offered Wednesday and Thursdays year round. Note: Departs approx. 1.5 - 2 hours before sunset. Please call Customer Service (the number will be on your eTicket) to confirm the current departure time. Complimentary hotel pickup is also available for guest staying in Palm Desert, Indian Wells, La Quinta, or Indio. Call Customer Service for your pick-up time. Advance reservations are required at least 48 hours in advance of desired tour date and are subject to availability. 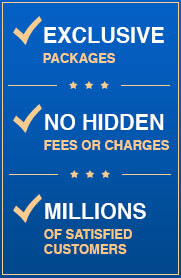 >>Cancellation Policy: Once booked within 48 hours, there is no refund. >>Wear comfortable clothing - we recommend you dress in layers as desert temperatures can change quickly. Wear closed-toe shoes with rubber soles (such as tennis shoes or hiking boots). Sandals and shoes with high heels are not recommended. >> Bring a hat and sunglasses and apply sunscreen before the tour. >> Don't forget your camera or video camera and make sure your batteries are charged up and you have plenty of film.